Hilda was born in Komna, Czechoslovakia, on Feb 22,1927. 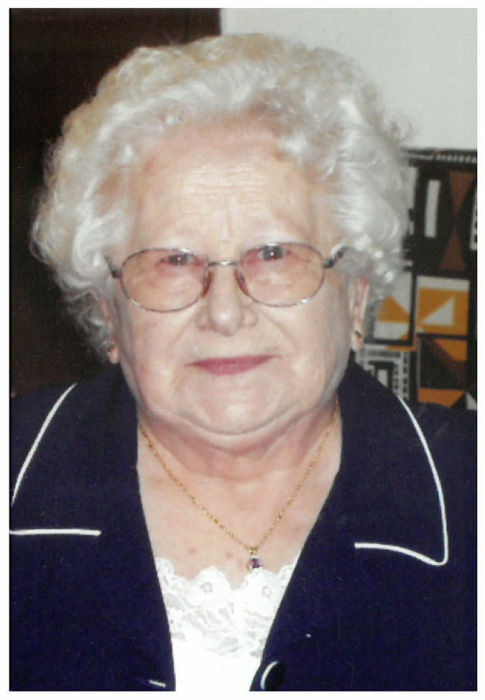 Born to Alois and Hedvika Kudelik, Hilda, along with her family, immigrated to Canada in July 1928 and settled in the Hamton district where she attended Menno Feldt School. During the summer months, Hilda and her sister Irene would be found helping young families with their children, and picking mustard in the fields (no chemicals back then). Hilda worked at the Red and White Store for Nora and Bob Wishart, an old fashioned general store which had everything in it - a post office, groceries, dry goods and hardware. Hilda also did housework and cooking. Winters were spent in Nebraska, USA with her cousins who owned a bar and grill. Upon returning to Saskatchewan, she was employed at the auxiliary hospital. In 1951, Hilda met the love of her life, Willie Padar, and they married on October 11, 1954 and spent the next 56 years together. They were blessed with two sons: Kelly in 1958, and David in 1961. Hilda was always very proud of both of her sons. After 20 years of service, Hilda retired St. Paul’s Nursing home in Melville. After retirement Hilda loved to garden and was very proud at her large harvest and beautiful raspberries. Hilda and Willie were blessed with six grandchildren: Terri, Chad, Chantelle, Wyatt, Joshua, and Cara and nine great grandchildren: Christopher, Katana, Savana, Noah, Jaxon, Arya, Liam, Willow and Dawson. They loved their grand and great grandchildren very much and helped out in any way they could. Hilda is survived by her two sons Kelly (Cyndi) and their children Terri (Ray) Driver, Chad Padar, Chantelle Padar (Danny Ward) and Wyatt Padar. David (Linda) and their children Joshua (Natalie) Padar and Cara Padar (Brandt Prince). Great grandchildren Christopher Mostert, Katana Driver, Savana Padar, Noah Fletcher ,Jaxon Padar, Arya Englot, Liam Padar, Willow Fletcher , Dawson Padar and sisters in law Irene Kudelik and Ann Padar, and numerous nieces and nephews , other relatives and close friends. Hilda was predeceased by her husband Willie in April 2011, her dad Alois in 1966, her Mother Hedvika in 1968, brothers Dennis in 1934 and Walter Kudelik in 2008. Sisters Irene Rafa in 2017, and Maria, who died in infancy. Brother in law Frank Rafa. Her father and mother in law, Kalman and Emilia Padar. Brothers and sisters in law Rudolph Padar, Mary and Ensel Gaura, Yoland and Albert Tuba , Betty and Mike Machinski, Agnes and Arnold Kitch , Edna and Nestor Herasymuik ,Mildred Nagy, Nicholas Koroll, Zolie Nagy and Frank Sass. Her godson and nephew, Dean Nagy, and nephews Darrell Guara, Alfred Tuba, Dale Kitch , Ray Padar and niece Shirley Tillet. My final words to my sons: I loved you both, be kind to each other, you only have each other now.